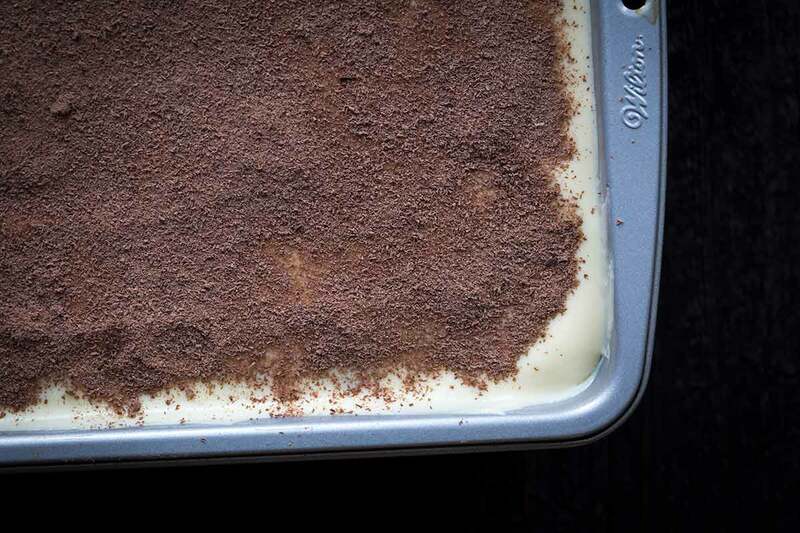 Tiramisu - Classically prepared but with cooked egg yolks instead of raw! 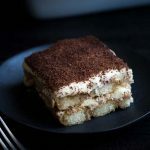 This is the Tiramisu recipe of your dreams: layers of coffee and rum-dipped ladyfingers surrounded by a rich, creamy custard and grated bittersweet chocolate. This classic Italian dessert is easier to make at home than you may think! 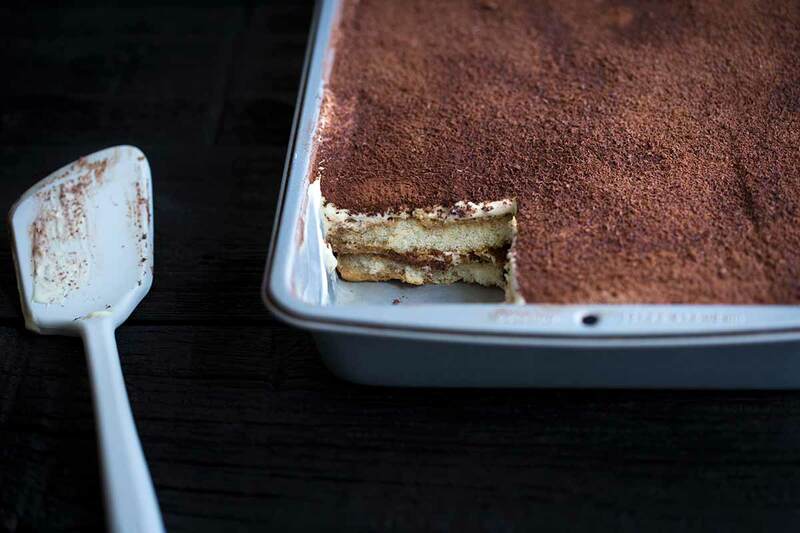 Even better, my tiramisu skips the raw egg yolks found in many traditional recipes. I still daydream about my brief visit to Italy two years ago. It was a work trip that give me amazing yet torturously quick glimpses of Florence, Pisa and Rome, and I didn’t get nearly enough time to do that one thing I love to do when traveling: eat. Had there been enough time, I would have been all over some tiramisu. 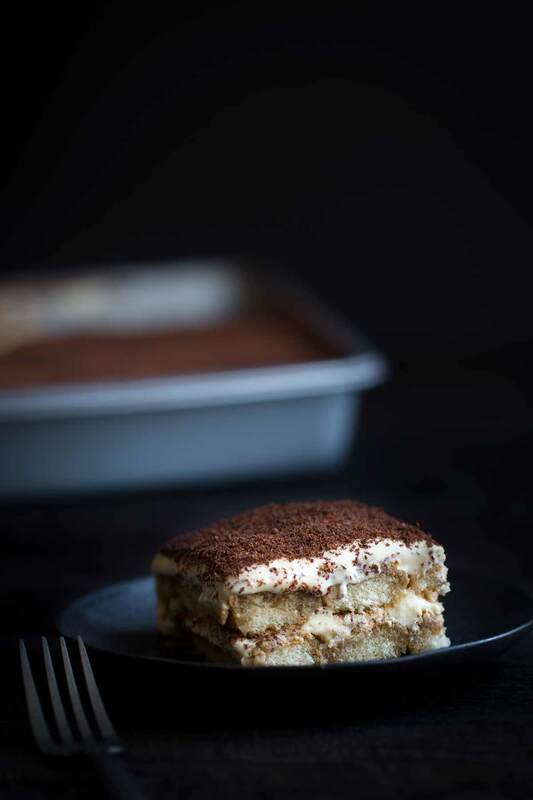 Tiramisu is a chilled dessert made from ladyfingers that have been lightly soaked in espresso, surrounded by a custard that’s made from whipped egg yolks, sugar, and mascarpone cheese. Layers are topped with cocoa powder or grated chocolate. Tiramisu literally translates to “pick me up,” and it’s often served in the afternoon in Italy. Mascarpone is a creamy Italian cheese that has the consistency of American cream cheese. However, do not substitute cream cheese here! The flavors are very different. While cream cheese is tangy, mascarpone is very smooth and buttery tasting. 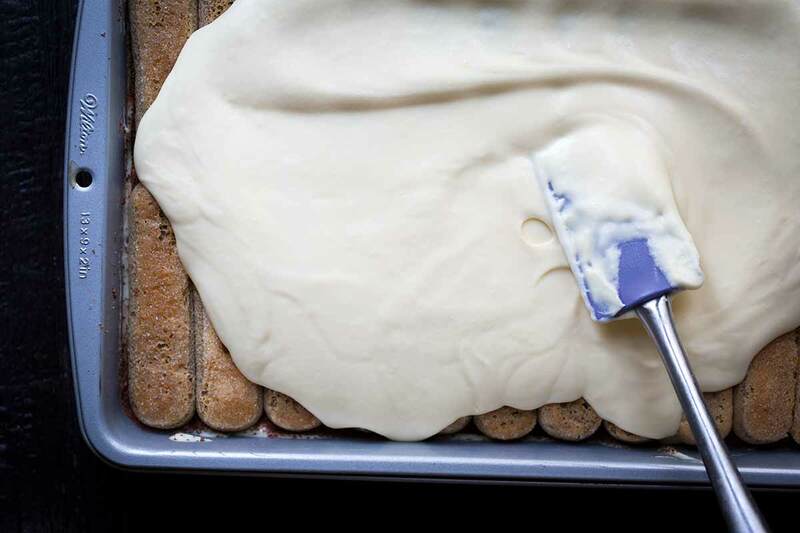 The tartness of cream cheese will ruin a delicate tiramisu. This is a traditional tiramisu recipe, with one main exception: tiramisu is often prepared using raw egg yolks. This can be a health concern, and we’ve had a couple serious food poisoning scares (once with eggs and once with oysters), so I don’t mess around. My version uses egg yolks that have been heated to 160 degrees, which will kill off things like salmonella. If you can find pasteurized eggs at the grocery store, those are safe to consume raw. They’ve already been heated to a safe temperature within the shells. I don’t see them available in many stores near me anymore, but I think this varies by region. Davidson’s Safest Choice Eggs is a good brand to look for (disclaimer: I worked with them several years ago, but have no relationship at the moment). Ladyfingers may vary a bit in size and shape depending on the style and brand you use. I went with savoiardi cookies and found a great brand on Amazon called Balocco. They were not the cheapest, and I’m sure you can find other options (or maybe you can find them at a local store for a better price). I will say, though, that these fit into my pan perfectly. I messed up the the first time I made tiramisu by dunking the ladyfingers in the coffee for too long. This is important: do not flip the cookies in the coffee and do not let them linger. Dunk them for one second. Think “One-one-thousand-LIFT.” They should still feel somewhat dry. Trust me; after 4 hours or more of soaking between layers of custard, the cookies will be soft enough. If the ladyfingers soak up too much liquid, you will have a mushy dessert that is seeping cold coffee into the pan. You don’t want that; the only thing that should be oozing is the custard. If you don’t drink alcohol, you can omit it from the recipe. I would add an additional 1/4 cup heavy cream to make up for some of the lost volume. As far as which to use, that’s entirely up to you. I used dark rum since it has a slightly more pronounced flavor than spiced rum. However, if you already have spiced rum, there’s no need to make a special trip to the store. Amaretto will add the most pronounced flavor out of the suggestions I’ve listed in the recipe ingredients, but none of them will be overpowering. Espresso is traditionally used in tiramisu, but you can get perfectly good results with properly brewed strong coffee. This is helpful for those who don’t have espresso machines. I like using a French press since it’s easy to control the strength. Most of the recipes I’ve seen call for cocoa powder, but bittersweet chocolate is completely acceptable as well. In fact, I prefer using it, but it’s a bit more of a pain, if I’m being honest. I use a microplane zester to grate the chocolate. Grating 2 ounces of chocolate by hand can get messy because the body heat from your hands will cause it to start melting a bit. It will get messy again when you go to sprinkle it over the layers of tiramisu. You can wear gloves to avoid messy hands. You can omit the bittersweet chocolate altogether, sifting cocoa powder over each layer. Or you can, you know, just wash the chocolate off your hands, knowing the deliciousness was worth the mess. Looking for more make-ahead desserts? You might enjoy my rum cake, milk panna cotta with coffee syrup, and nutella cheesecake bars! I also love these chocolate peppermint swig cookies from Baking a Moment. 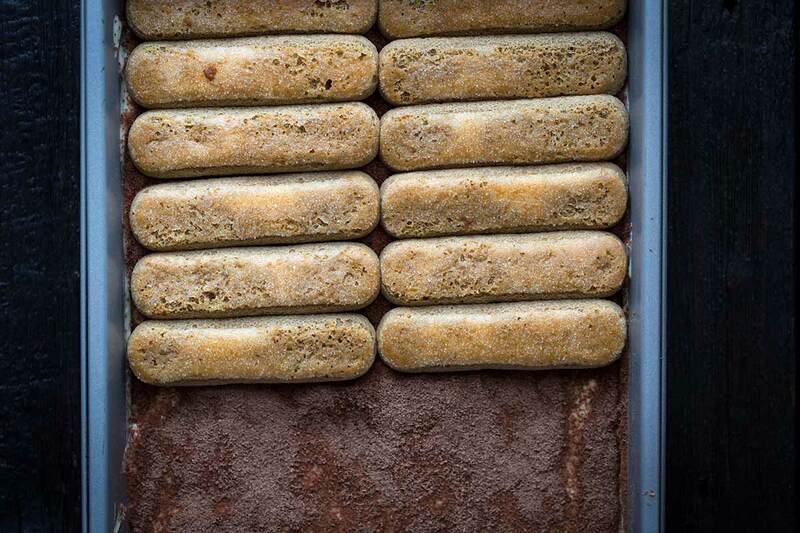 This is the Tiramisu of your dreams: layers of coffee and rum-dipped savoiardi ladyfingers surrounded by a rich, creamy custard and grated bittersweet chocolate. In a pie dish or shallow bowl, combine the coffee with 1/4 cup rum, and set aside. Whisk together the yolks, sugar and salt in the top of a double boiler (or in a stainless steel bowl set over a pot of simmering water). With the heat set to low, stir almost constantly with the whisk, until the temperature of the yolks reaches 160 degrees F, 10-15 minutes. (See recipe notes; you can skip this step if you purchase pasteurized eggs). Remove from the heat and pour the yolk mixture into a stand mixer fitted with the whisk attachment (or use a large, clean bowl and an electric mixer). Beat until pale, thick and creamy, approximately 4 minutes. Add the mascarpone cheese and remaining rum. Mix on medium speed to incorporate the ingredients, which will look lumpy. Turn off the machine, scrape down the sides of the bowl, and turn the speed up to high for 3 minutes, until thick and very smooth. Using a stand mixer with the whisk attachment or an electric mixer, beat the heavy cream to a stiff peak (this can also be done by hand with a bowl and whisk). Fold the whipped cream into the yolk mixture. Grab the pie dish with the coffee, and place it next to a 9x13 dish (standard baking dish, glass, ceramic, etc). Very briefly dip the ladyfingers into the coffee, then line them along the bottom of the pan (my pan held exactly 24 per layer). Do not flip the ladyfinger in the liquid to coat the other side evenly, and do not hold it in the liquid. Too much liquid = mushy dessert that seeps coffee. Once you have a single layer, top with half of the custard mixture, spreading evenly with a spatula. Sprinkle evenly with half of the grated chocolate. Repeat with the remaining ladyfingers, custard, and chocolate. If desired, sift a light coating of cocoa powder on top of the bittersweet chocolate to fill in any chocolate gaps (this is more about presentation than flavor). Cover the pan tightly and refrigerator for a minimum of 4 hours or overnight. To serve, scoop into individual bowls or onto plates. Pasteurized eggs can be difficult to locate in stores, but if you can find them, you can skip the step of cooking the yolk mixture to 160 degrees and place it directly in the mixer. Ladyfingers can vary in size and quality. I used Balocco Savoiardi Ladyfingers, and had great results. In my opinion, this has a perfect balance between custard and ladyfingers. 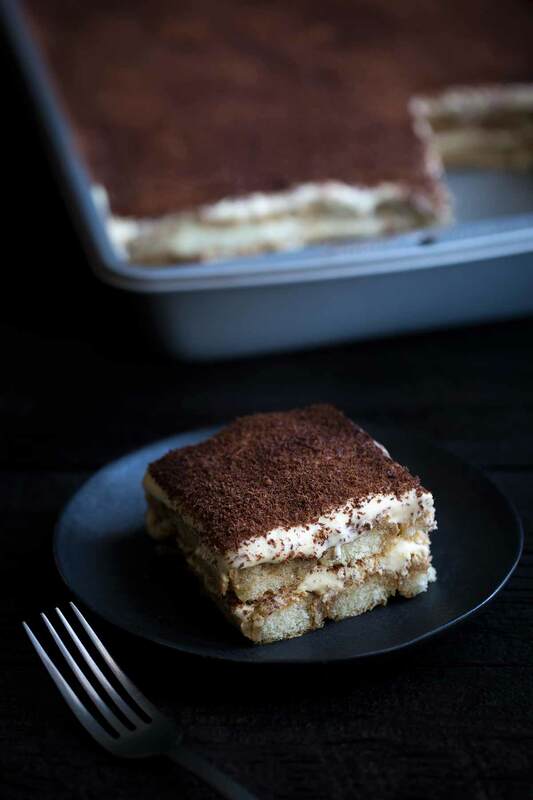 However, some versions of tiramisu have thicker custard layers. If you want thicker custard layers, you can increase the custard ingredients by 1/2 or even double. This will increase the time required to heat the yolks to 160 degrees, as well as possibly the time required in the stand mixer (only by a minute or two). Loosely adapted from Italian Classics, by Cook's Illustrated. Such a favorite dessert for so many! Looks so delicious! Absolutely the best recipe! Your instructions were so helpful. I was always intimidated to try. It’s so flavorful and light! Thank you! Hi..thanks for delicious recipes..what can I replace for rum or alcoholic liquid that’s been used in this recipe? Hi Kianna! I actually have notes about this in the post, which I will add to the notes section at the bottom of the recipe (I should have done that in the first place). You can omit the alcohol from the recipe. No need to replace it with a new ingredient, but I would add an additional 1/4 cup heavy cream to make up for some of the lost volume. I used your recipe and the results were absolutely amazing. My guests thought I bought it from a gourmet Italian restaurant. I was amazed at how easy it was to make and really appreciated the tip on how to dip the ladyfingers because I can’t eat it when the cookies are soggy. So thanks again for the fabulous recipe. I’m so glad to hear you loved it as much as I do! This was EPIC. 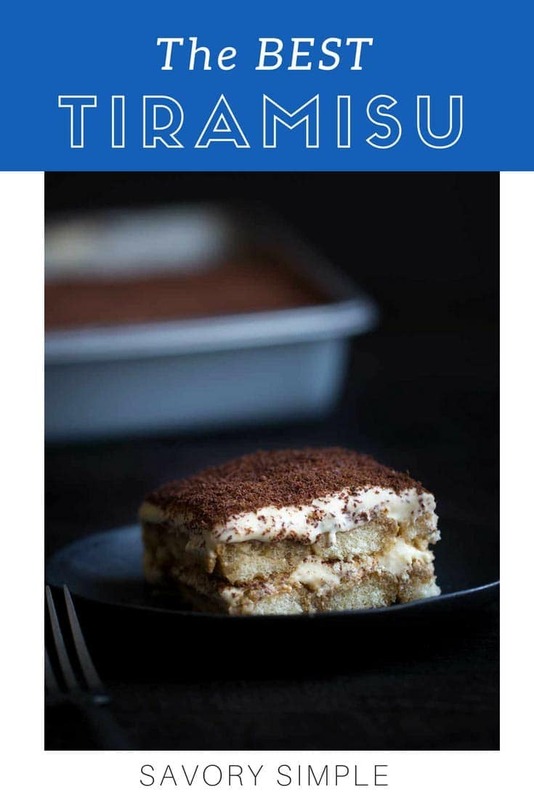 I can’t believe I’d never tried making tiramisu at home before, it’s my husband’s favorite dessert! I chose your recipe because of the detailed instructions, was a little worried when I was double boiling the egg yolks since it got really thick, but my friend loved it and said it taste almost the same as the cakes he bought from cake stores. Best compliment ever!